Home > Blog > Do You Know What’s Hiding In Your Woods? Summer is here! Well, according to the calendar anyway. I haven’t seen the sun in more days than I care to count. As I write this, Memorial Day is just around the corner, and it is a great time for me to talk about the health of your woods. Lots of people will be on the road, heading up to their cabins/woodland, so let’s talk about a few things you should think about this summer. First and foremost, DO NOT BRING FIREWOOD from your home to your cabin in the woods. Unfortunately, frequently people have a tree cut down in their yard and think what wonderful firewood they are going to have. If it is very likely that the tree was cut down because it is sick, whatever made it sick is still living in that dead wood. When you move the firewood, then you move the bug or disease that killed it to its next source of food, your lovely woods. So, the official recommendation is to NOT MOVE FIREWOOD more than 10 miles. I want to talk briefly about a couple of bugs to keep a watch for this summer. The first is gypsy moth. Their egg masses are starting to come alive, and soon we will have the caterpillars stripping trees of their leaves. 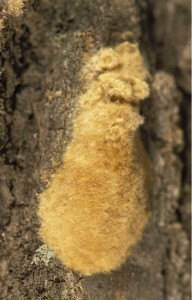 The images below will help you with identification of both the egg masses and the caterpillars. If you have yard trees you want to protect, there are suggestions on destroying the egg masses and barrier bands on this website . However, barrier bands aren’t realistic for a woodland setting, and the best option for controlling massive populations is through several state run spray programs. The DNR has a program for suppressing large outbreaks, and DATCP has a program to slow the spread. If your property is in Western WI, in particular, you may want to look into it . 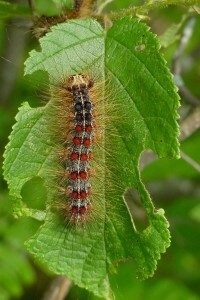 They do aerial application of naturally occurring controls that affect the digestive systems of gypsy moths only. While gypsy moth has very little preference for species of trees, you should also keep an eye on your ash. Emerald Ash Borer (EAB) is making its way around the state, with more finds recently in Trempealeau, Brown, Sawyer and Oneida counties which are on the leading edge of spread. Images of the adult, along with some symptoms on ash trees are below. You can prevent the potential impact of EAB in your woods, by removing some of the ash in your woods through timber sales or firewood (used on-site, of course). There is no widely used control for EAB at the moment. There are regular updates on the spread of EAB on the DNR website .